Our Glass Blowers from Mexico use 100% lead-free glass from recycled soda bottles. Although the glassware is very similar in height and width, No two pieces ever look identical, which adds to the appeal and uniqueness of our traditional hand blown glass from Mexico. Our glassware is dishwasher safe, just allow a short cooling off period before using them if the heat/dry cycle was used. Magellan Traders, authentic hand blown glassware is not tempered. Each glass has tiny air bubbles blown within the glass that when exposed to extreme temperature changes can expand and cause the glass to crack, such as boiling liquid, or ice cold liquid poured into a warm or hot glass, so some extra care is necessary. Don't be fooled by the imitation glass from overseas factories that looks hand blown but is not. 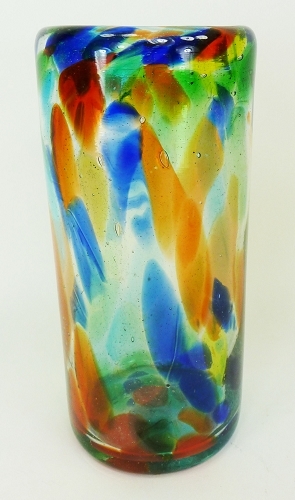 The imitation glass is machine made, very thin, and nowhere near the quality of our authentic Hand Blown Mexican Glass. 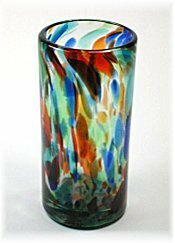 There glasses were hand-blown, diverse in the color pattern, no two were alike (which makes for a special look on the table), solid in construction, and overall, they had a good feel in the hand when full. They also complimented the tableware we use, which is modern in style, with vivid colors. I am very please with these glasses. They are beautiful. I am very pleased with them. No two are alike as advertised. I've replaced ALL my glassware with this series. They are unique and beautiful! I have sets of the ice tea, the tumblers, the 'rocks' and the wine goblets. They are simply beautiful! Love Love Love these. They are beautiful with color and style. I ordered a lot more....my current glassware is going to the basement.